Well, I mocked up the turbo on my old dead engine.. I had to make the oil feed lines (stainless braided), oil drain line looks like it'll work if I just rotate the spigot on the engine to the side... still will have to figure out the coolant hoses... for summertime I might just bypass the heater in the cab and run it, but I'll have to T into the lines there somehow later. Still haven't ran coolant to mine.. maybe one day. Made my own oil drain from 1/2" EMT bent it up and made a flange from steel.. lol. 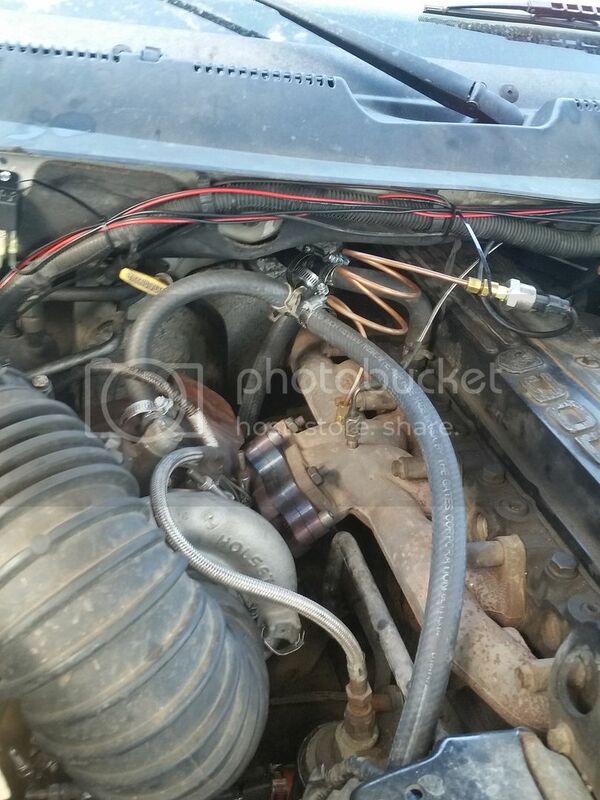 Just get a couple 5/8 coolant hose t's and splice into the feed and return of the heater core. very easy to do an cost less than $20 for all the hose, t's, and clamps. I'm trying to make it look neat... if I'm gonna try and sell this idea to BD, I kinda have to. What kind of sensor are you using for exhaust gas pressure? It's under the 30* spec'd by cummins at this point. The exhaust sensor is just a 0-100psi sensor that farm dude linked to on the cf. can you get a better sweep radius out of it ? if not still looks fine though.